You can call it a coping mechanism, but the colder it gets in winter, the more plants I add to my house. 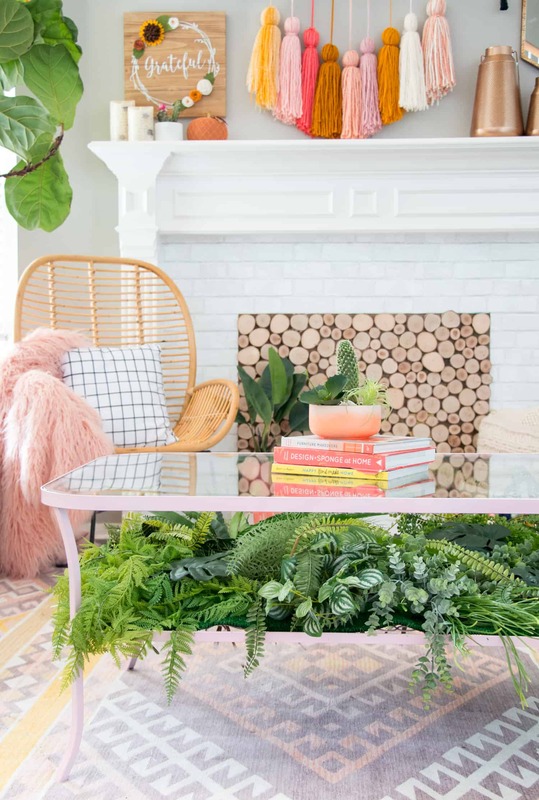 Adding tropical or desert plants into my space totally tricks my brain into thinking warm and happy thoughts. So I’ve been looking for any excuse to add more. We are getting pretty close to completing our front sitting room, but I had an area of open wall space that was too narrow to add furniture but really needed a little something-something. Since plants are making me so happy right now, I thought a tall narrow planter would be just the ticket to fill the space and add a little more greenery as well. 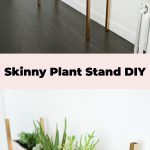 Large planters can get crazy expensive, so of course a DIY version was in order! Depending on how tall you want your planter to be, you can adjust where you mount your legs to the window box. It was helpful for me to use small clamps so I could stand back and see different heights, but I ended up having the bottom edge of the window box be 10″ down from the top of the square tube leg. Once I had the measurement of leg placement, I unclamped the legs and used a metal drill bit to drill two holes through the aluminum tube (just use a bit that’s big enough to fit your machine screws through). It may sound complicated to drill through metal, but aluminum is really soft, so it’s actually easier than drilling through some hardwoods. I re-clamped the legs back in place on the planter and used the same drill bit to drill into the two holes and through the wood of the window box behind the metal tube (that way the holes would line up exactly). If you don’t have clamps, you can just lay the box facing up on the floor and have someone help you hold the leg in place. The clamps make it easier to do it by yourself if needed. I would normally use gold spray paint to paint the legs, but it’s a high of 28 degrees today (too cold to spray paint outside). So I used my favorite gold paint instead. Just make sure to keep track of which leg goes on which spot on your planter so you know the holes will line up exactly when you go to put them back on (I put a post-it next to the legs to mark which was which). Once the paint is dry, cut to size 4 squares of peel and stick felt for the bottom of the tubes so the metal doesn’t scratch your floors. I painted the box with a pale pink called Baby Blush by Valspar (it’s the same color as our pink dining room on the other side of the sitting room). Use your machine screws and corresponding nuts to attach the legs back onto the planter. Make sure to tighten the nuts well on the inside so you don’t have wobbly legs. Add your plants to your window box insert and your planter is in business! Oh man, SO CUTE! I’m all about adding plants around my home (we have several in every room, including the bathroom!). My only thought – is it tippy? Should you secure it to the wall at all? So cute! I wish I didn’t have cats so I can make one of these!! How do your cats handle it? I would think mine would jump on it and knock it over right away! I feel ya with the weather. My mom works at the botanical gardens by us and every Monday they clean out some of the plants that they don’t need anymore so I’ve been making her check each week and hoard all that she can get. So needless to say I have quite the plant collection at the moment. This is a great diy! I mean, I love gold and brass colors and all that jazz, but it’s almost a toss up to me – on leaving the aluminum tubing unpainted! I miss having window sills too! They are really good about plants, they don’t bother them at all! Excuse me while I gush…. Laura, you are so inspiring! 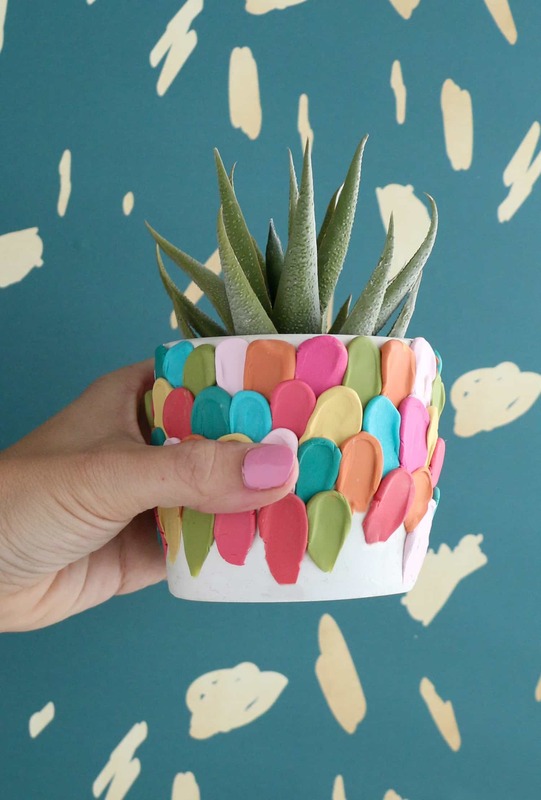 You have had so many DIYs recently that I absolutely love. Succulents and gold anything – yes please! This is so chic! This is actually so cute I love it! This is way too cute!! I NEED to make this! And I will! Thank you so much for sharing this awesome DIY with us! Yes! Agree on the hashtag, everything Laura does is so cute! I really like the color you picked! Cute and easy! This is so cute… I loved it so much.. Amazing!! This is awesome as always, I am so in love with your interior projects! This is a lovely idea! Thanks for the inspiration!! So awesome! I can’t wait to make this. Can you tell me where you got the cool black and white art above it? Thanks!! This is perfect! I love that it’s so portable. And looks pretty easy to make, too! Perfect ! So beautiful ! Oooooh I really like this!! I love this! What a great idea and so easy! wow, very informative. I never knew that. Love this and the succlents! I just wish I had a blank space that needed this. I thought of doing this for my patio for about a second, until I realized a good gust of wind – which we do get a lot – would knock it right over. But still a great share – good inspiration for future projects! I don’t have a lot of plants so this might be obvious to some one else, do you take the insert out and to a sink to water it? Where does it drain? I’m just so enamored with how that gold paint turned out! Mind if I ask what your process was? It looks like a perfect spray finish to me! Hi Laura! Can you share where the black and white art is from too?? Thanks!! This is adorable. You seriously have the cutest stuff in your home, Laura! And I love that it is all very fitting to your style and specifically you. This is amazing – I really want to try this for my hallway because it’s so slim and fits into any small space! I love this planter! It is seriously so so cute! So cute! That pink is amazing. 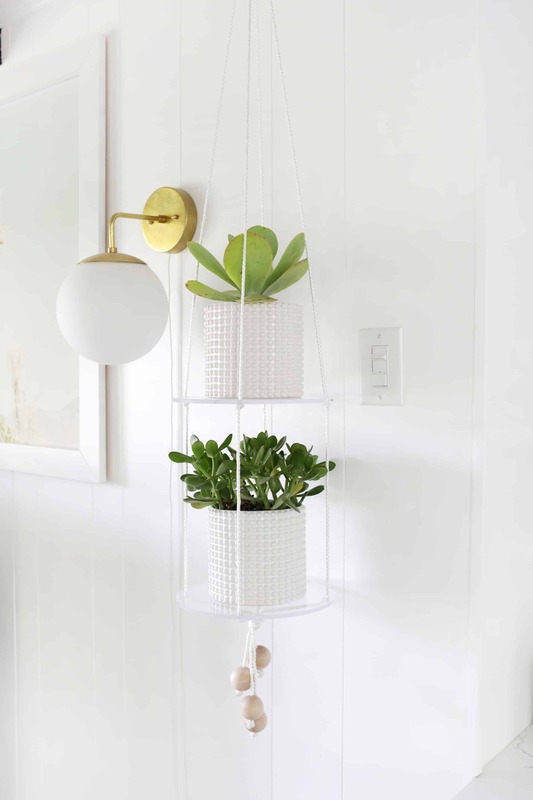 Oh my gosh, this is the exact DIY piece I’ve been looking for…without knowing it! I’ve been slowly picking up greens for my new home, but need to fill up one spot under a few shelves. Can’t wait to give this a try! I love this stand. It definitely seems like a doable project. Where is the white plant stand next to it from? LOVE this DIY, thank you for sharing! I’m thinking of recreating this in my apartment. Where did you get the legs from?